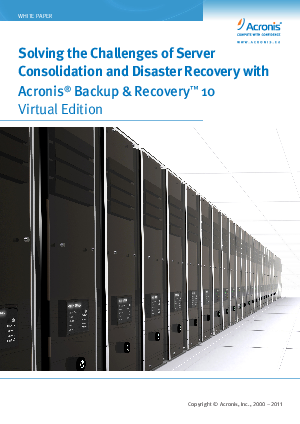 What impact does your choice of software have on your ability to carry out server consolidation and disaster recovery? It could have plenty. If you’re consolidating servers to lower IT costs, you should read this paper. And if you’re concerned about your ability to carry out a disaster recovery within the tight timeframes today’s virtual environments demand, you should read it. In this paper we introduce initiatives you can put into effect to survive and thrive in our virtualized world. Then we show how Acronis virtual solutions can save administration time, lower IT expenses and improve your ability to meet both RTO and RPO goals. We’ll discuss the value of a unified approach to server consolidation and virtual machine disaster recoveries and tell you how to get the keys you need to “drive” your own trial version of the finest data protection software available for virtual environments.